What good is being a corporate lobbyist and having a fat, luxe Ferrari if you can't hear the "Ron & Fez" show on the way to the day spa? No damn good, we say. But take heed. Ferrari will include XM Radio and XM NavTraffic as standard equipment in the 612 Scaglietti flagship grand tourer, along with three years of service. I guess just listening to the engine won't cut it anymore. Maybe if XM had a channel that only played Ferrari V12s... Hmm. WASHINGTON, Aug. 7 /PRNewswire-FirstCall/ — XM (NASDAQ:XMSR) , the nation's leading provider of satellite radio, announced the first Ferrari model to come with factory-installed XM Satellite Radio and XM NavTraffic real-time information service. The Ferrari 612 Scaglietti will come equipped with XM Radio and XM NavTraffic as standard features that will be incorporated into the vehicle's advanced audio and navigation system. 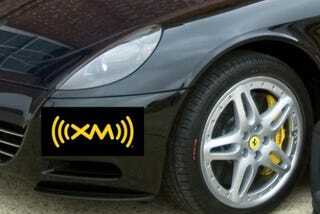 Ferrari will include three years of XM Radio and XM NavTraffic service with each vehicle. "XM is now available from Ferrari, one of the most prestigious vehicle makers in the world," said Steve Cook, executive vice president, Automotive, XM Satellite Radio. "Now Ferrari drivers can enhance their driving experience by discovering music and listening to sports, talk and news on the more than 170 channels of XM Radio. XM NavTraffic also enables Ferrari drivers to route around a jam so they can continue to enjoy the road." XM NavTraffic is available in 79 major U.S. markets, alerting drivers to real-time traffic information. The data is delivered to the driver's GPS navigation system via XM's satellite pipeline to provide information on current traffic conditions, such as traffic speeds, accident locations, and road closings. Where available, XM NavTraffic also provides information that allows users to view an overlay of color-coded traffic flow information, indicating the average speed of travel along the driver's planned route. XM (NASDAQ:XMSR) is America's number one satellite radio company with more than 8.2 million subscribers. Broadcasting live daily from studios in Washington, DC, New York City, Chicago, the Country Music Hall of Fame in Nashville, Toronto and Montreal, XM's 2007 lineup includes more than 170 digital channels of choice from coast to coast: commercial-free music, premier sports, news, talk radio, comedy, children's and entertainment programming; and the most advanced traffic and weather information. XM, the leader in satellite-delivered entertainment and data services for the automobile market through partnerships with Ferrari, General Motors, Honda, Hyundai, Nissan, Porsche, Subaru, Suzuki and Toyota is available in 140 different vehicle models for 2007. XM's industry-leading products are available at consumer electronics retailers nationwide. For more information about XM hardware, programming and partnerships, please visit http://www.xmradio.com/.